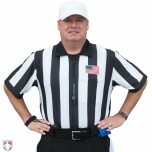 High school football referees in New Mexico (NMAA) wear 2 1/4" stripes with USA flag on chest above the pocket. 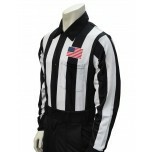 Highly recommend this referee shirt. Very comfortable, looks good, and keeps you cool on warm days. I'm planning on buying 2 more for my wardrobe. 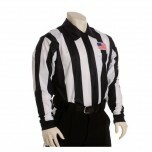 This should be the only referee shirt you consider buying. The absolute best fitting/feeling shirt I've owned and I've bought shirts from close to all the companies out there. Quality, quality, quality, spend the money once and you won't be disappointed. 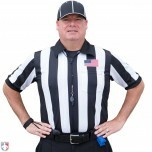 The cold weather referee shirt does a nice job stopping wind and holding body heat. It is over-sized just a little, but does not give/flex at all when trying to put it on or remove. Suggest one size larger than standard long sleeve.